It might seem odd during a period of so much innovation and advancement in photographic technology that a film developer formulated in the 19th century should be so popular with photographers and printers in the 21st century. But the world famous Rodinal, at well over 100 years in production, is just that. Formulated in Germany by Dr. Momme Andresen, and introduced commercially in 1891, the Para-Amidophenol Hydrochloride developer was first used in highly concentrated form for rapid development of plate films. It was only when Leica cameras started to gain popularity in the 1930s that the developer was also found to be very suitable for giving high acutance and sharpness at much higher dilutions with the new miniature films… thus a legend was born. Whereas many modem formulations claim to do one special thing or another, i.e. reveal finer grain, higher speed or better sharpness, Agfa’s Rodinal simply develops films better than most others. Most importantly it will give brilliant negatives to work from with as much gradation of tone as can be reproduced on modern printing papers. Rodinal is very easy to use, being a “one-shot” developer and has an advantage over some special brews in that it can be used with all slow, medium and some high speed films and in any format from 35mm and 120 rolls to 5×4 inch and larger sizes. Because the recommended dilutions for Rodinal are between 1:25 and 1:75 the developer is very economical to use. It also has an extremely long shelf-fife and loses none of its potency even when turning from its original pale straw colour when new to the colour of strong tea after a year or more. One anecdote relates that a bottle of Rodinal, found in the ruins of a building in Germany after the World War II blitz, was perfectly usable after 30 years! At the high dilution of 1:25, 1:50 and 1:75 Rodinal acts as a “compensating” developer. This means that whilst the developer produces full shadow details to work from in the negative the highlight areas don’t become too dense that they block-up highlight details. A typical subject requiring compensating development is a high contrast “against the light” landscape shot. Average exposure and development would give a high contrast negative which would need manipulation at the printing stage to show shadow and highlight detail in the finished print. 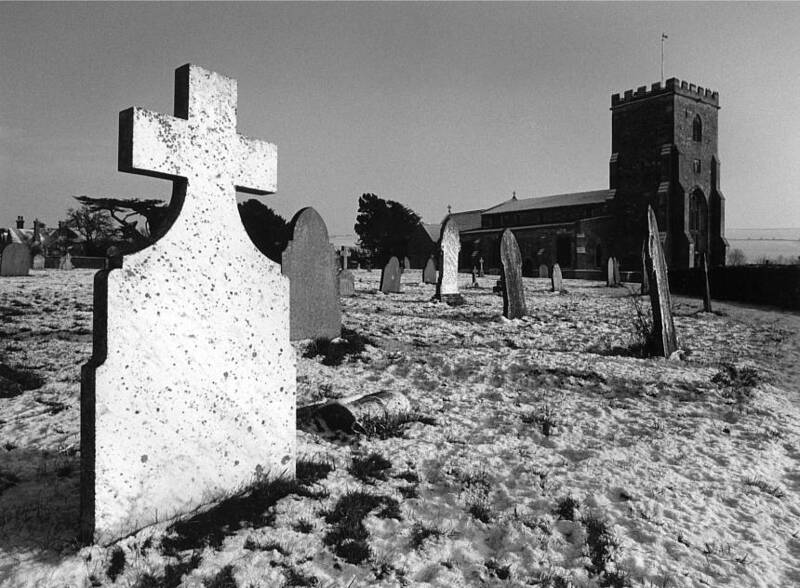 In the above image of the church in Market Lavington, Wiltshire, the contrast was high… strong late afternoon sun lighting the gravestone with the church in shadow and many mid-tones in the trampled snow. I used a Canon F1n with a 35mm Tilt & Shift lens fitted with an Orange filter… and APX 100 developed in Rodinal 1:50 printed on my favorite Multicontrast Classic paper and developed in Neutol WA. Film, film developer, paper and paper developer were all Agfa’s products… and very satisfying to work with when this sort of result appears in the developer dish. Rodinal’s characteristics do have to be seen and experienced to be believed. It is not the finest-grain developer around but it does, at these high dilutions, produce extremely sharp grain and negative images with a real bite to work from. Because modern emulsions are much finer-grained than those produced 100 years ago Rodinal now gives discerning photographers, both amateur and professional, printed results that were not possible when the developer was invented. Whilst Rodinal may not be looked upon as a standard developer by the photographic industry in the same way that llford’s ID-11 and Kodak’s D-76 are regarded, it is interesting to note that llford lists (among other developers) Rodinal at a 1:25 dilution complete with recommended developing times for it’s newer Delta 400 high-speed emulsion at normal, pull 1-stop and push 1-stop exposure indices. Flattery indeed… other manufacturers should follow suit. Agfa’s own outstanding black-and-white emulsions APX 100 Professional is an extremely fine-grained medium-speed film which, if processed carefully in Rodinal, gives as fine a grain as is likely to be required with most photographic subjects and situations. Perhaps it should rank as a “standard” brew. A big advantage of using a medium-speed film such as APX 100 is that it’s fast enough for hand-held camera use but not so fast that on bright days creativity is limited by the necessary use of small apertures or high shutter speeds. Ideally all negatives should make good prints on a grade 2 “normal” paper. With different rolls being exposed to several subjects of different contrasts, this is still possible with APX 100 and Rodinal if the developer is used at different dilutions. By following the Golden Rule of black-and-white photography to – Expose for the Shadows… Develop for the Highlights – contrast of the negative can be lowered or raised according to the subject’s original tonal contrasts. Because over-development, or an increase in developer strength, cannot appreciably raise the density of the exposed shadow areas (in the region of lightly exposed silver halides there is almost nothing to actually over-develop), the developer strength or developing time can be varied to lower or increase the highlight areas. If the subject contrast is very flat the dilution of Rodinal can be reduced to 1:25 or even less so that the increased developer activity boosts the exposed high-tone areas and produces a negative with an expanded tonal range. On the other hand, if the subject’s contrast is very high the dilution of Rodinal can be increased to 1:75 or more to fully develop the negative without over-developing the highlight areas. Both these developing manipulations should produce corresponding negatives with tonal ranges which have a ratio of 1:7. Negatives within this contrast ratio will produce good prints without manipulation and show a black, white and a balanced scale of grays in between. Although much of today’s photographic technology has a lot of latitude built in, optimum quality is best obtained with care and attention paid to each stage of the photographic process. It can then be repeated again and again with guaranteed results every time. Agfa’s Rodinal falls into this category, although at well over 100 years old it is positively ancient and not modern. Nevertheless it has many qualities that other modern developers have only recently caught up with. Rodinal is undoubtedly a classic in every sense of the word and the many photographers who continue to use it, or indeed who have only recently discovered it, never look back… their results probably speak for themselves. Footnote: Since the demise of Agfa many traditional (film) photographers have missed the familiar APX 100 and 400 silver-boxed brands on their dealer’s shelves. However, Agfa APX 100 and 400 should be available from the Lupus Internet Store at http://www.lupus-imaging-media.com/content/view/22/31/lang,en/. Also, the well-known German company Hans O. Mahn (Maco products) produce a 22-page PDF file on their Rollei R3 film at http://www.mahn.net/PDLiefe.htm which is claimed to be Agfa APX 100. Other films rebadged as Agfa APX 100 include Arista II 100, Jessops Pan 100s and Rollei Retro 100. Note: Rodinal is also available from other manufacturers branded as Calbe 09, Classic F09 and Fomadon R09.